Provider-replacement therapy popular among three-quarters of the C-Suite. 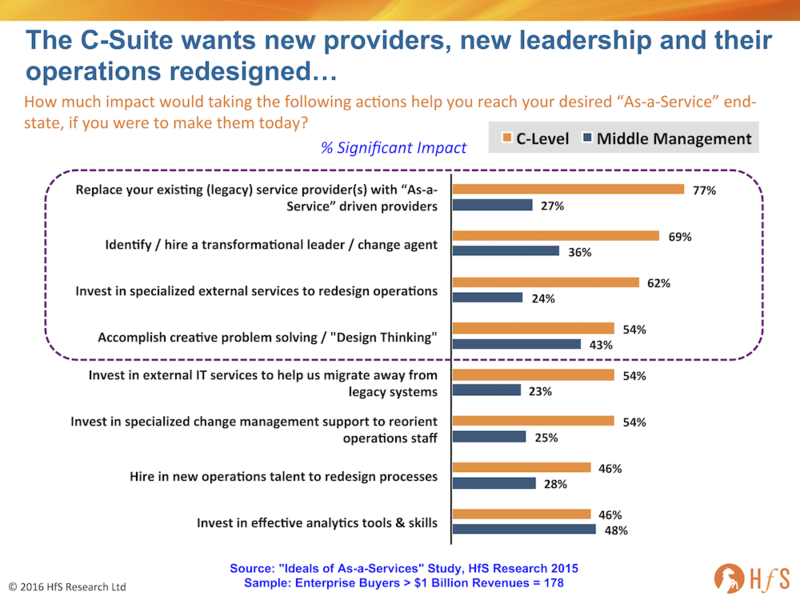 A staggering 77% of leadership want to see their legacy service providers replaced, compared with only 27% of their middle management. This is because corporate leaders have reaped the labor arbitrage fruits from legacy outsourcing, and know their middle layer is getting fat-and-happy meeting their SLAs and performance metrics. Nothing will change without forcing the issue - the incumbent provider has little interest reducing the predictable headcount-based revenue it is serving up, and automation threatens both the provider's margins and the middle management's job security. Ripping out the legacy is the only sure-fire cure to breaking the inertia cycle. Provider-replacement therapy worked when the C-Suite demanded the expensive ITOs were kicked out for the hungry India-centric providers (remember all that fuss the fat-and-fluffy middle then made about the perils of offshoring). Now, the C-Suite wants to replace this new legacy with automation-driven service solutions. 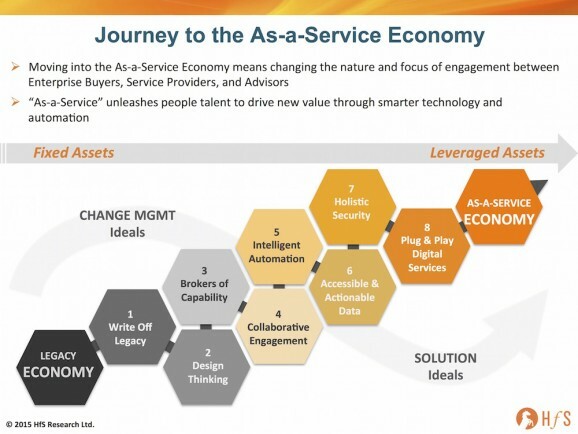 This is a continuous cycle of cost take-out and better effectiveness and now we're onto the next wave....The As-a-Service Economy. The C-Suite want to bring in transformational leadership to be the change agent to redesign their operations. Clearly, the C-Suite recognize the inertia below them, with close to seven-out-of-ten strongly believing that appointing a transformational leader would have a significant impact. Only 36% of the middle later believe that bringing in someone to shake things up would have a real impact on their enterprise... they probably think they are already doing a great job and some big swinging exec wielding a Harvard MBA would fail to get into the real weeds of their operations. Outsourcing is very much the direction the C-Suite wants to take to do the redesigning. 62% see a genuine need to bring in external specialists to redesign their operations, compared to only 24% of their middle layer. Clearly, leadership realizes their existing team just doesn't have what it takes to do much more than keep the same old widgets turning. Hiring external help to force the change-cycle is clearly the path most companies are going to take. This is great news for service providers geared up to deliver As-a-Service capability, which have the desire - and investment chops - to hijack legacy deals from legacy competitors upon re-bid. Both C-Suite and middle management view Design Thinking as a powerful method to drive creative change. This is the one area where both camps are in alignment, with roughly half seeing Design Thinking as having a significant impact. This is because Design Thinking is a collaborative vehicle and most people, believe it or not, actually like to collaborate to get things done better. 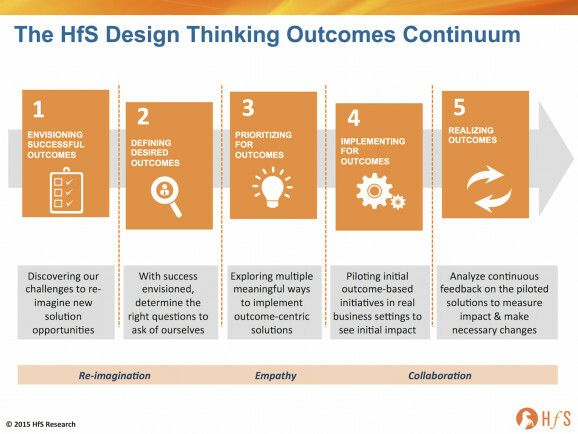 Design Thinking provides a mechanism to drive creative problem solving (and problem finding), and the more this is embedded into service engagements, the more it involves both leadership and middle management, the more impactful it will be. Expect to see the Design Thinking paradigm grow in traction and momentum over the course of this year. What's startlingly apparent, is that the C-Suite is clearly ready to make real impactful changes to their organizations to drive out more cost and really look to design their business operations more intelligently. It's also very obvious that most know they can't change what they have with their current middle layer and legacy service provider relationships. The only way to do this is to entertain competitive rebids that are radical - and include real change parameters, such as an effective Robotic Process Automation strategy, a genuine focus on self-learning and Cognitive Computing and to leverage Design Thinking to understand truly how business models can be transformed to take advantage of Digital technologies. People often complain the C-Suite only get involved when deals are brokered and then they retreat to let their middle management run the operations... well, people, now is the time for the C-Suite to step back in to broker than next wave of services transformation. The gap between C-Suite and middle management is staggering but to anyone who has spent time in corporate America not surprising. This storm system has been brewing for years. The C-Suite has rewarded and perpetuated the plodding and incrementalist thinking of middle management, while ignoring Bezos' and Kalanick's dogged pursuit of bold and audacious new business models that are broadly applicable to most industries. The C-Suite aptly gets a Gentleman's C for lacking this imagination, so is now throwing lifelines to outsiders who it hopes can inject the level of change required to survive in this new economy. Great opportunity for A players. Phil - excellent article. Data is not surprising, but the size of the gap is. Good article...is the genie finally out of the bottle now? Phil - very well written. This was a real eye opener for me - and gives us some real direction as to what to expect in the next couple of years. It's time for change and time for service providers to get their act together to offer next-gen services! Robert Cringely has recently suggested that IBM are about to reduce its workforce by 25%, as-a-service has caught up with them. Have the c-suite left it too late? Phil - terrific article as always. I think there's 3 different messages here. One, Clearly C suite urgency for transformation and appetite for disruption risk in recognition for the dire need to get transformation done is outstripping the mid management who have to shepherd through the disruption and whose worldview on the urgency is also muted. This is consistent with everything we are seeing with clients. Two, I think the provider replacement therapy needs to be interpreted less literally but more from the perspective of dramatically changing the engagement model. And while clearly existing contractual models impede the shift to as a service delivery; the fact is that a new model has to be set with the existing or new provider - so if the provider is progressive, then there's far more value in having a real business conversation with the provider as opposed to following "the grass is greener" philosophy where the marketplace seduction for a new provider to broker away a deal at any cost is actually not very condusive to a sustained as a service model.. No one does innovation at a loss at scale (unless of course pure innovation is the source of market valuation like software startups) - so actually from a buyer perspective the better route is to really establish whether they have relationship with a progressive and capability investing provider - and if that's the case then they are better off renegotiating their old world contract with them than reverse auctioning it in the marketplace The third message is the need for a real mind shift change to go to a as a service contract. Too often in our experience the need from the C suite gets distorted as it filters down the organization and finally ends up in a rehashed version of an old world commercial with new world needs .. That's obviously unsustainable and again in our opinion we believe that we really need the market intermediaries to really drive that different mindset with more conviction than is evident in the majority of the cases. In my view, smart C-Suites are realizing they need real change and have take a chainsaw to their legacy to make the shift. Some are simply removing legacy managers who are clearly not up to addressing the progressive model, while others are also realizing their only real choice is to look at more progressive service partners. Phil & team ... I can attest to your findings being very consistent with my recent experiences. Top management is sold on the idea that business services should be delivered in fashions that conform to our experiences as consumers. They abhor the protestations from lower levels that complexity demands customized solutions. Further, the lens is pointed at front-office and middle-office functions with just as much focus as back-office. One would think that these new domains present great opportunity for the providers that are market-oriented, and not account-beholden. Seems to me that mindsets among functional leaders and their service providers need to embrace this, or they will all fall through the gap. It's time to bring real "As A Service" solutions to the enterprise service architecture. Great article and good to see the data on these topics. You mention that "corporate leaders have reaped the labor arbitrage fruits from legacy outsourcing" - how much have they really realized of what they planned? Or are they just terrified that they haven't realized the savings or brought innovation after these years and so now want to jump up and take action? Phil, Excellent presentation. Your research confirmed what we suspected with regard to the C-Suite and Operations Management conflict of expectations with BPO. The focus on "cost take out" remains the buyer priority and getting to a profitable partnership remains a challenge. So what is the bottom line? 77% of CXOs want change (which I agree with @shantanu could be more the engagement model than the absolute vendor), can we say only 50% of those really want change?… that goes to just over a third of CXOs who are really looking for an aaS play… in the foreseeable future… makes sense? Outsourcing is just one step in transformation, not an end state. The C-suite, in their haste to cut costs in response to quarterly earnings. forgot that there is always something else to do. While - I've found that the "trigger phrase" used in the market by those who are not quite sure what they are doing is, "We can convert to outcome-based or transactional pricing." Buys should watch out for this ... it's NOT the same as "As A Service"! @peter - I tend to agree - only shifting the pricing from FTE to transactional - is rarely addressing the underlying issues, and only results in a marginal improvement in tying volume to price, as opposed to genuine outcomes to price. I am increasingly seeing a smart approach to RPA as the start of as As-a-Service journey for some. Until you clean up the data, remove the manual interventions and have better end-to-end visibility of process, you can't really do a hell of a lot. Am seeing a very large number of (mainly small-scale) RPA deployments in play - and a couple of providers are doing these at a very low cost (and free pilots in some cases) with their clients. Great article but not really surprising for me and not new thinking. I have been involved in Business Transformation for over 25 years as a Management Consultant. I can count on one hand where it was the middle management speaking to the C-suite that resulted in Consultants within their organisation. Middle managers are concerned with their weekly / monthly targets and staying within budget. We all know enterprises that have failed with the majority of targets being met. CEO's are interested in generating and increasing shareholder value, developing and implementing strategy and plans to stay ahead of the competition. We are at a point in history where technological advancements appear to be speeding up to a point where it is difficult for CEO's or anyone to keep up. Cloud Technology, Mobile Internet, Automation of Knowledge Work (RPA), The Internet of Everything, Wearables, Advanced Robotics, Connected and Autonomous vehicles, Energy Transformation (usage, renewable. green) , Smart Buildings, 3D printing, Advanced / new materials such a Graphene, Advanced Real Time Pervasive, Corrective and Invisible Analytics, Cogntive Computing, etc. CEO's need more assistance from Transformation Leaders than ever before to understand how their enterprises can lever most value for their Customers and Shareholders from technology and how new technology will affect their employees and business processes. Google, Facebook, Amazon and Apple are all using the majority of the technologies listed above already and a disrupting and destroying whole traditional industries. Companies such as GE and IBM have totally reinvented themselves in less than a decade just to keep market share. The next two years will increasingly see enterprises adopting transformative technology. The basics haven't changed though. Over the years I have seen many organisations jump to the 'solution' first. They are sold an IT, Tech, Digital solution which they implement only to find the benefits and experience has not solved all the problems the solution was to solve. Gartner have reported that up to 50% of ICT projects fail. Before any major Digital / IT spend and implementation the following should come first. Does the proposed solution align with the Strategic and Operational Objectives of the business? Does the solution solve any of the businesses main problems and issues? Will implementing the solution move the business towards meeting the business goals and objectives? Has the ICT strategy been created injunction with the overall Strategy? Have Directors, Customers. Stakeholders and employees been consulted? Will the solution add value to Customers and enhance end-user experience? Will employee roles change as a result of the solution being implemented? Many fantastic systems are created but are not owned or understood by people using them. Will the proposed solution enhance and streamline current Business models / Processes? Too often new technology is imposed over the top of the existing processes without looking for opportunities to reduce activity and automate. Can the business processes be re-engineered and fully automated end-to-end? Will Customer interaction be enhanced? Technological advancements are all around us in our workplaces, in our homes and in our towns and cities. The enterprises that embrace the appropriate digital technology that enhances their products and services. streamlines their operations are the ones that will grow and be the most successful in the coming decade. It is REALLY clear on the disconnect. C-suite has no concept what it takes to change out a supplier. Middle management knows all too well what that kind of change is like. The middle spends their whole selves protecting the C level from the noise of these transitions. Data is not surprising at all. Just proves how well the middle shield the top from the noise at the bottom. @Simon - completely agree with your statement: "Over the years I have seen many organisations jump to the ‘solution’ first. They are sold an IT, Tech, Digital solution which they implement only to find the benefits and experience has not solved all the problems the solution was to solve"
I have been at pains to explain to people that "Digital Transformation" is first and foremost a business transformation, which is empowered by Digital technology (analytics, social, collaborative, RPA). However, I would argue that this new wave of technology-infused transformation is different from the "same old" cycle of years gone by, with the key difference being the potential of RPA. Poorly integrated processes and data has been the perennial excuse for companies doing little to make real "Digital" progress, but there are now real platforms out there to make (often small and uncomplex) but very meaningful improvements to remove manual interventions from processes. Offshoring provided a cost-takeout interlude - and suspension - for many buyers making the real, painful changes. But with offshore now a commonplace activity, the real onus shifts to automating work that should have been fixed years ago. A new CXO joined the company and on his first day the outgoing CXO handed him 3 envelopes marked 1,2 and 3. “Thanks to these 3 letters given to me by my predecessor, I had a great time in this company and now I’m giving them to you. Open these 1 by 1 when you run across a big problems. All the best” said the outgoing CXO. Things were smooth for first 6 months but then the first disaster struck. The new CXO tried his best but could not solve the problem and was called to board of directors to explain. Before going into the meeting, out of curiosity, he opened the first letter - “Blame your predecessor, me” . He did exactly that and the board believed him. Over the next few weeks the problem was resolved on its own. Around six month down the line, he faced even a bigger challenge. This time he was confident and opened the 2nd letter - “Launch a new transformation program with latest buzzword”. Once again he followed the advice and launched a massive program and even to his surprise was successful. Durgesh, great story. The circle of life...or maybe the cycle of life is running in a lot of places with questionable and perhaps suboptimal outcomes. Consolidate, then expand, then consolidate once again. Just make sure whose ever idea it was at each stage gets a big raise and promotion along the way. The bigger the company the harder it is to see the cycle come around, but it does. Sometimes it is so big, you can't see it. So how will the Automation cog fit into the cycle? Not sure, but Phil's data suggests big eyes are on it and want to influence it so something will surely happen. In the last 20 years we figured out how to insert the external resource models into the legacy environment to claim some victories. The drive was cost savings, skills availability and scale. Now the ear/eye-candy is automation, transformation, innovation and leadership wants it. Being in middle management and suffering from what Phil talks about above, I don't need to be educated on how shinny the candy is as much as I need some help to build the journey so I can eat some. The legacy environment is no small thing and I just don't believe it is going anywhere soon. Many companies are too successful to just throw I out. Technology-Infused Transformation, however, offers lots of goodies to choose from and the suppliers I want to associate with going forward are those that can help me find the path to the promise land continuing the great service I already get today, being my caddie for the decisions I need to make next, and aligning with flexibility and wisdom to grow with me to wherever I go. I have faith some of my current relationships will be the suppliers I need thereby avoiding replacement therapy. Folks, Some great comments/dialogue here. The point about CxO motivations - how about putting yourself in the shoes of business leadership in these times. For the CEO, despite all the talk and promise of innovation, the gap between the legacy chains and the agile future is vexing. The whole legacy model of the business (and how it is operated) is being turned on its head by technology. For example, the impact of fintech plus an overall squeeze has caused banks to shed assets, people in large numbers - they just cannot continue as before. Change is causing discontinuities and yet the markets and investors are relentless in their expectations. We are now headed (in the macro world and within the sector) towards strong disinflationary shifts that the world of IT services will see so much more than just the tremors so far, to a point where there is nothing to give more from within the construct of services and IT costs of operations. For sure responses over the past 3-4 years - to cut costs and work on automating the model, acquisitions etc. as an attempt to keep pace do clearly reflect this consequence to service providers. Perhaps well within the new trends discussed herein, of as-a-service, automation and more are encapsulated methods to do more in this direction but worth reflecting how things may sharply go from here. Mindset shifts are not just about the middle management IT reluctance or provider hesitation in canablizing or analyst mindsets etc., it is also about the possibilities that we are not considering yet that which maybe on us sooner than we expect? Reverse auctioning of IT/BP as-a-services models anyone? Great post and the ensuing discussion Phil. I think that the fundamental question is : If your providers aren’t making or saving more money for you by proactively bringing thought leadership, flawless execution and partnering to effect change, are you with the right partner?